3 Bedroom Detached House For Sale in Newcastle for Guide Price £225,000. This beautifully appointed three bedroom detached property has been extended to create spacious and well planned accommodation comprising: entrance hall, lounge with bay window to the front elevation, dining room with French doors leading onto the rear garden and modern fitted kitchen to the ground floor. To the first floor there are three bedrooms and a family bathroom. 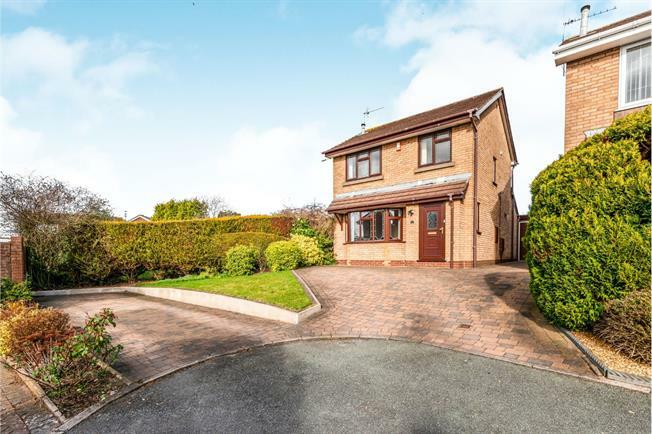 The property enjoys an ample plot with generous amounts of off road parking to the front, side driveway leading to a garage/workshop and enclosed rear garden. Viewing is essential to appreciate what this lovely family home has to offer. Front entrance door, radiator, double glazed window, light point, stairs to the first floor. Double glazed bay window to the front elevation, feature fireplace housing a gas fire, under stair storage cupboard with light point. Double glazed French doors to the rear elevation leading onto and overlooking the rear garden, radiator, ceiling light and wall light points. Range of fitted units at eye and base level, work surface over housing a stainless steel sink and drainer with glass splash backs. Integrated gas hob with extractor hood above, double oven, space for a dishwasher and fridge, there is space for a washing machine housed in one of the base units. Double glazed window and rear door, two strip lights, tiled flooring, electric under floor heating with wall mounted control panel. Double glazed window, radiator, light/fan and fitted bedroom furniture. Double glazed window, radiator, light/fan. Panelled bath with shower over, pedestal wash hand basin, low level WC, airing cupboard, double glazed window, radiator. To the front of the property is ample amounts of brick block paved driveway with a side driveway leading to the workshop garage. To the rear is a landscaped garden, laid to lawn with mature borders, patio seating area, shed, water feature and outside tap and lighting. The front up and over door has been sealed to create a workshop. Side access door, two double glazed windows, light and power.